Forrest Reynolds has essentially been banned for a year. 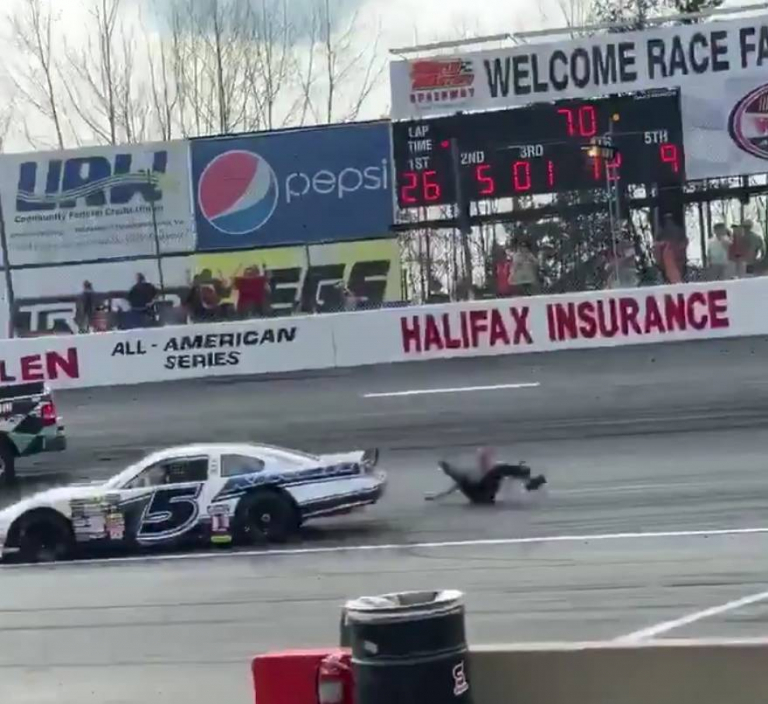 Forrest Reynolds jumped into the window of a race car during red flag conditions. He was then ejected from the moving car. Watch the video of the red flag altercation as well as the racing that led to it. Lee Pulliam and Phillip Morris were battling with 5 to go in a 75-lap event at the short track of South Boston Speedway. Pulliam left the door open, Morris filled it with his late model and contact was made for the position. On the same lap, Pulliam drove it deep into turn three and put Morris in the fence. The red flag was displayed and the clean up crews went to work on the race track. Meanwhile, the cars came to a stop in turn one. Forrest Reynolds, crew chief for Phillip Morris jumped over the pit wall and entered the race track. First, he tossed his radio at the windshield of Lee Pulliam. He then walked around the car and climbed in through the passenger side window of the race car. Speculation states that the crew chief was attempting to rip up the ignition wires which sit on the dash. At this point, Pulliam was cranking the engine. When it fired, he did a burnout and took off in a hurry. He shook the steering wheel right and left, ejecting the crew chief from his race car. Forrest Reynolds hit the ground and rolled to a stop. Meanwhile, the race car took off just inches from the crew member. The late model division at South Boston Speedway is sanctioned by NASCAR. That puts the penalties in their hands. As stated, Forrest Reynolds will be unable to get his NASCAR licence until next year. Lee Pulliam, he drove off with a crew member attached to his race car, has also been fined $1,500. He’ll set out on a driver suspension until April 17th. He will be required to pay the fine before returning to the track. He’ll also be on probation until December 31, 2019. Phillip Morris has also been fined $1,000. He’s suspended only until the fine is paid. If Morris attempts to bring Forrest Reynolds as his crew chief to any NASCAR it will bring new penalties. Morris is also on probation until December 31st, 2019.